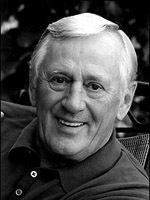 Len Cariou portrayed Sweeney Todd in the original production of Sweeney Todd, the Demon Barber of Fleet Street. 05/22/1981 1201 The Headhunters In the future: Erna Stearns, a reactionary still chooses natural food and believes in normal relationships despite living in a period where people are modified to become model citizens by a computer. When her fianc� suddenly calls off their engagement, she asks her father to look into the matter and they soon discover a terrifying government secret. One of my favorite actors ever! His magnificent voice is perfect for radio! Leonard Joseph "Len" Cariou (born September 30, 1939) is a Canadian actor, best known for his portrayal of Sweeney Todd in the original cast of Sweeney Todd: The Demon Barber of Fleet Street, which earned him a Tony award. He currently plays the patriarch, Henry Reagan, NYPD Police Commissioner (retired), in the multi-generational television series Blue Bloods on CBS. In 1968, Cariou made his Broadway debut in The House of Atreus. Two years later, Cariou landed his first starring role opposite Lauren Bacall in Applause, a musical adaptation of the film All About Eve. In 1973 he garnered his second Tony nod for A Little Night Music; he repeated the role of Fredrik for the 1977 film version opposite Elizabeth Taylor. Six years later he won both the Tony and a Drama Desk Award for his portrayal of Sweeney Todd: The Demon Barber of Fleet Street in the Stephen Sondheim musical opposite Angela Lansbury. During these years, Cariou also appeared in a number of benefits, including A Christmas Carol for the Riverside Shakespeare Company in New York, playing Scrooge, with Helen Hayes, Raul Julia, and Mary Elizabeth Mastrantonio, directed by W. Stuart McDowell at the Symphony Space in 1985 From 1985 to 1992, Cariou was seen on multiple episodes of the popular television mystery series, Murder, She Wrote opposite his good friend and former Sweeney Todd costar Angela Lansbury. Cariou portrayed the recurring character of Michael Hagerty. Hagerty was an Irish international man of mystery who worked as a secret agent for British MI-6. He would get Jessica Fletcher (Angela Lansbury), the title character of the show, involved in mysteries involving international intrigue. In 1995, Cariou became the first actor to portray Walt Disney in the Annette Funicello biography A Dream Is A Wish Your Heart Makes: The Annette Funicello Story based on her book of the same name. In 1997 Cariou appeared in the Star Trek: Voyager episode "Coda". He appeared to Captain Kathryn Janeway as a alien disguised as her deceased father, Admiral Janeway. In 2010, Cariou appeared as Madoff-like Ponzi scheme man Louis Tobin in FX's drama Damages, the main antagonist in season three. He currently appears as Henry Reagan, the former NYC police commissioner and patriarch of the current commissioner's family, on Blue Bloods. Also on television, Cariou has appeared in episodes of The West Wing, Law & Order, The Practice, and The Outer Limits. He had a continuing role in 2006–2007 as power broker Judd Fitzgerald in the Showtime series Brotherhood.